California, years ago in 1906. Over 3,000 people were killed and 225,000 people were left homeless. 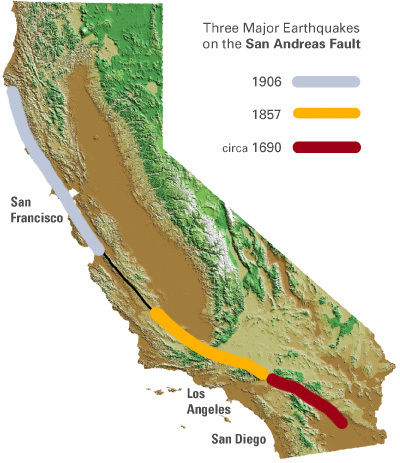 In Southern California, the last major earthquake on the San Andreas fault was more than 150 years ago (1857), rupturing the fault from Central California to San Bernardino. Few people lived in the area, so there was very little damage. Further south along the San Andreas fault, from San Bernardino through the Coachella Valley to the Salton Sea, more than 320 years have passed since the last major earthquake (around 1680). Another major earthquake is likely to happen on this section of the fault within our lifetime, and will shake all of Southern California. A study led by the U.S. Geological Survey describes in great detail the extensive damage and casualties that result from such an earthquake, and recommends many ways that we can keep this natural disaster from becoming a catastrophe (see Tsunami and other hazards and One plausible big one). While the San Andreas is most likely to be the source of our largest earthquakes, there are hundreds of other faults throughout Southern California that could also cause damaging earthquakes. Some may happen before the next San Andreas earthquake and could be even more destructive if they occur directly beneath densely populated areas. 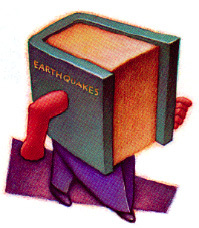 This handbook is a resource for living in earthquake country. It provides information about why we should care about earthquakes in Southern California, what we should do to be safe and reduce damage, and also what we should know about earthquake basics. STEP #1: Identify potential hazards in your home and begin to fix them. STEP #2: Create a disaster-preparedness plan. STEP #3: Prepare disaster supplies kits. 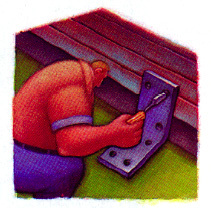 STEP #4: Identify your building's potential weaknesses and begin to fix them. STEP #5: Protect yourself during earthquake shaking -- drop, cover, and hold on. 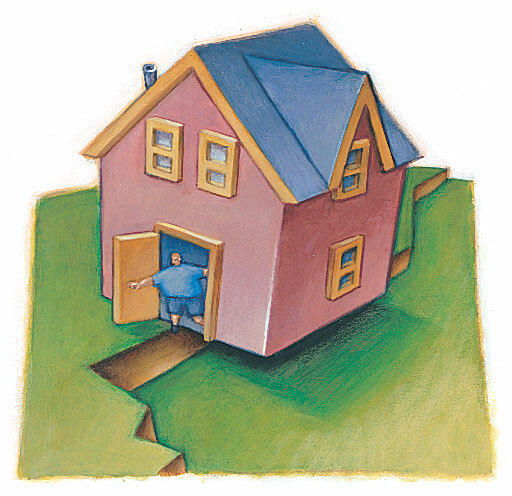 STEP #6: After the earthquake, check for injuries and damage. Evacuate if necessary. STEP #7:When safe, continue to follow your disaster-preparedness plan. Copyright 2011, Southern California Earthquake Center at the University of Southern California. Reproduction by permission only. SCEC is a research consortium supported by the National Science Foundation and the United States Geological Survey, headquartered at the University of Southern California. Disclaimer: The suggestions and illustrations included in this document are intended to improve earthquake awareness and preparedness; however, they do not guarantee the safety of an individual or a structure. The writers, contributors, and sponsors of this handbook do not assume liability for any injury, death, property damage, or other effect of an earthquake. Contributors: SCEC (USC): Ilene Cooper, Thomas Henyey, Tran Huynh, John Marquis, Glenn Song, Brion Vibber; USGS: Dale Cox, Kenneth Hudnut, Sue Perry, Ken Rukstales, Michael Rymer, Bob Simpson, David Wald, Lisa Wald; FEMA: Hassaan Sughayer, Dennis Sylvester, Doug Bausch, Jeffrey Lusk; California Emergency Management Agency: Greg Renick, Deborah Steffen, James Goltz, Kate Long, Terrie Monaghan; California Geological Survey: Jerry Treiman, Chris Wills, Charles Real; California Seismic Safety Commission: Fred Turner; California Earthquake Authority: Nancy Kinkaid; Insurance Information Network of California: Candy Miller; American Red Cross: Peggy Brutsche, Rocky Lopes; County of Los Angeles: Joyce Harris, Phyllis Tan, Larry Collins; Caltech: Vikki Appel, Egill Hauksson, Margaret Vinci; Harvard: Andreas Plesch, John Shaw; KFWB: Jack Popejoy; Ready America: Dean Reese, Brian Lowe, Jeff Primes; and many other members of the Earthquake Country Alliance. Illustrators and Photographers: Todd Connor (p. 16, 17, 23); Ann Elliott Cutting (p. 13, 19, 21, 22, 24, 25); Dale Glasgow (p. 26); Min Jae Hong (p. 30); Stephanie Langley (p. 4, 6, 12, 20, 22, 23, 28); Punchstock (p. 24); Jere Smith (cover, p. 2, 3, 32); Zeke Smith (p. 14); and Robert Zimmerman (p. 16, 18, 20, 22).